When asked about the CCTV’s coverage on the Oct 1st National Day Parade, the surveyed gave an overwhelmingly negative response. Their complaint range from poor camera angle and shot selection, idiotic commentary, to the constant bombardistic music. Tough crowd, indeed. 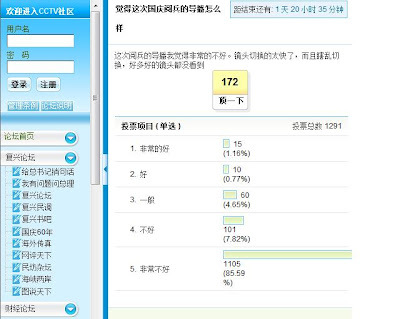 Some of the "colorful" comments from other Chinese forums are very "creative"
From CCTV's own website: 12 voted for "very good" and 1105 voted for "very bad"
Finally, after all that loud noise, no DF-41 at all. It seems to be only a myth and notreality. eh thought ppl said china didnt have freedom of speech, what is this then?